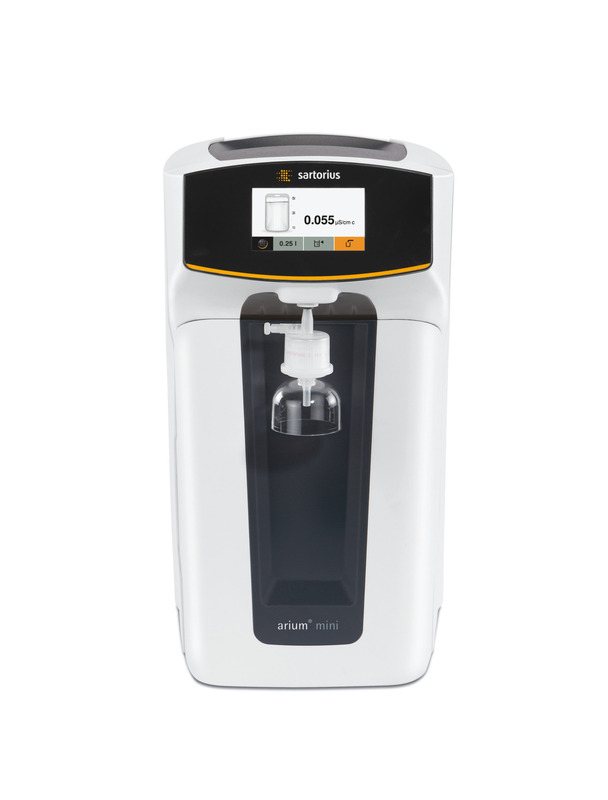 The arium® mini plus and the arium® comfort are the highlights of the Sartorius lab water systems. 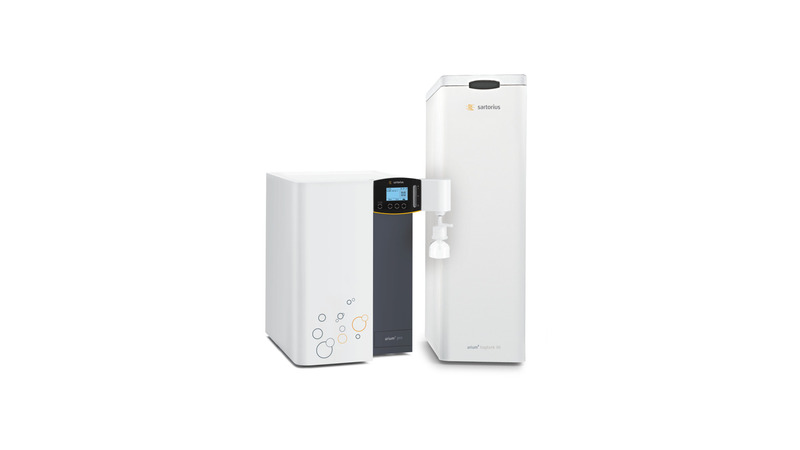 Featuring the most advanced purification technologies, these systems deliver Type 1 ultrapure water combined with Type 3 (mini plus & comfort I) or combined with Type 2 (comfort II) pure water, depending on the version you select. Ideal pretreatment by the combination of activated carbon, catalyst and downstream reverse osmosis module for reliable removal of oxidants, free chlorine, salts and organics. Reliable removal of organic components by UV oxidation (185 |254 nm) down to < 5 ppb. Time-saving volume-controlled dispensing simplified by numeric input. Controlled purified water quality by entering a limit setting. The only water system with integrated bagtank technology! The arium® mini plus is a compact system designed to produce ultrapure Type 1 water for your daily lab needs of up to 10 liters. For preparation of Type 1 water, the system automatically purifies tap water into Type 3 pure water using an integrated reverse osmosis stage, at a performance rate of 8 liters per hour. The purified Type 3 water is then stored in the unique, side-integrated arium® Bag until it is pumped directly from the bagtank for ultrapure water production on demand. Freshly prepared Type 1 water can then be dispensed at a rate of up to 1 liter per minute. The disposable arium® Bag is easy to exchange in less then 5 minutes, enabling you to easily renew your bagtank for trouble-free storage. This saves you from having to perform time-intensive and hazardous sanitization. Moreover, the arium® Bag integrated on the side reliably prevents any secondary contamination of your Type 3 water for Type 1 purification, while ensuring consistent long-term water quality. Ideal combination of high-quality activated carbon and catalyst for reliable removal of oxidants, free chlorine, heavy metal ions and particulate contaminants. Expand Your Comfort Zone in the Lab! The arium® comfort systems produces Type 1 ultrapure water combined with Type 2 (comfort II) or Type 3 (comfort I) pure water, depending on the version you select. The systems deliver up to 2 L/min of Type 1 water and can be used for standard applications all the way up to critical analytical procedures. In addition, the clever, integrated iJust feature automatically optimizes your product water quality and usage. Simplify your Type 2 and Type 3 water storage with the unique bagtank! Protected in the connected, closed arium® bagtank, the Type 2 water produced is stored for further use, safely protected from secondary contamination. Easy to change out, this arium® Bag will save you not only from having to perform time-consuming cleaning, but also from exposure to hazardous cleaning agents. Depending on your application, integrate a UV lamp to reduce organic impurities (TOC). You can also have the TOC continuously checked by the optional TOC monitor – for complete reliability and peace of mind. The innovative bagtank reliably stores Type 2 or Type 3 water produced by arium® comfort, in 20-, 50- or 100-liter disposable arium® Bags that are easy to exchange. Securely isolated from the environment by integrated filter systems, this arium® Bag provides reliable protection against secondary contamination, while ensuring consistently high water quality over the long term. Moreover, unlike typical laboratory water storage tanks, the disposable arium® Bag is easy to change in less then 5 minutes, eliminating not only time-consuming cleaning, but also exposure to hazardous cleaning chemicals. Specially designed for the pharmaceutical industry, the arium® Bag made of high-quality S71 material also provides optimal storage conditions, thus ensuring constant, long-term Type 2 water quality.